Our belief in personal autonomy as a religious value is often used to undermine Reform Judaism, which is presented as a pick and mix lifestyle lived by buffet Jews. In this essay, Rabbi Miriam Berger of Finchley Reform Synagogue outlines the intellectual framework in which such decisions can be made, and argues that this reflects an authentic tradition in Judaism. Judaism has never been a one-size fits all, easy to define monolith that suddenly splintered in the 1800s. There was no authentic, true Judaism but a beautiful variety of traditions and legal variations, which emanated out of a system built on discussion and disagreement. To find the “truest” Judaism is to entirely miss the point. Reform Judaism today stands proud as critical inheritors of a rich and vibrant intellectual, legal and storytelling tradition. I meet people on a daily basis who fundamentally miss the point of Reform Judaism. Many of them are members of Reform synagogues, others are trying to prove its inauthenticity compared to other denominations. It becomes clear that they don’t understand what Reform Judaism is when they describe it through its practice; Reform Judaism means men and women can sit together, drive on Shabbat or eat in ‘unkosher’ restaurants. Though these may be outcomes, they are not definitions. Reform Judaism is not a series of practices but rather a decision making process which has different outcomes for different individuals, rabbis and communities. Reform Judaism is a most traditional form of Judaism because it continues the discourse that we are familiar with from texts such as the Talmud and responsa literature. Judaism was always and still is about a continual debate, taking earlier texts and exploring their meaning in one’s current context. Whether understanding prayer after the destruction of the temple or shmitta when living in the diaspora there has always been a conversation which holds in tension the power of the past and its tradition with the considerations of the present day. Reform Judaism is a structure through which we can continually be part of that dialogue creating today’s Judaism. The Reform Movement in the UK has twice tried to articulate what factors have a voice in this continual dialogue. First by Rabbi Tony Bayfield in his book “Sinai, Law and Responsible Autonomy” published in 1993[i] and then in 2012 with the launch of the Reform Movement’s L’Chaim educational programme [ii]. Bayfield defines the conversation by use of two equilateral triangles. 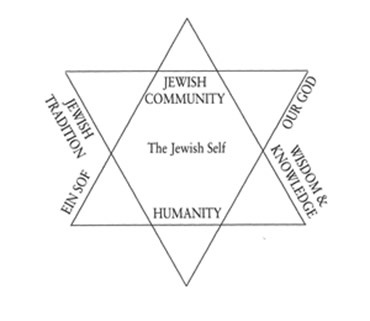 The shape I believe is central to the explanation, not simply because two equilateral triangles when placed over each other form a ‘Magen David’ (a Star of David), but because the shape helps explain why it is perfectly legitimate for my Jewish practice to take a slightly different form to yours. Essentially each side of the triangles represent an aspect of the decision making process. When first explained, each side has equal weighting yet a fundamental aspect of Reform Judaism is that we each must have the conversation ourselves and cannot rely on the ruling of a rabbi to have it for us. This means the evidence that I may choose to give more consideration to, others may give less and vice versa. What makes us a Movement is the shared decision making process, the shared debate and not a necessity for a shared outcome. The key is to understand what factors should go into your inner dialogue. 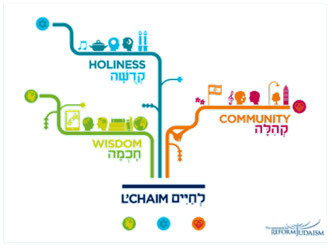 These may be the three components of the L’Chaim course: community, wisdom and holiness; or the 6 factors of Bayfield’s triangles. In both cases the decision should be made responsibly and thoughtfully within an intellectual framework. Our God, Jewish tradition and the Jewish community all form part of our exclusively Jewish selves. They are the aspects that we expect to form part of the Jewish debate. When we say that God should be part of the decision, we are not awaiting an intervention such as a booming voice or a physical sign, but instead we find God’s voice in considering the moral imperative or how this deepens one’s faith or spiritual life. Jewish tradition may be the most tangible. Do we have texts to guide us or a tradition passed through the generations? Community is what ensures we do not create our own individual Judaisms which bear no resemblance to each other. Community highlights the aspects which both draw us together and form our uniqueness. These three factors cannot work in isolation because although they may represent the Jewish self, the self has other forces acting on it. Morality does not come just from our God and God of our ancestors but also from a much more global sense of morality. Our wisdom does not come only from Jewish text but from science, experience of history, art and culture. Jewish tradition cannot be the only basis for wisdom in this debate. The Jewish community is only part of the wider community that our decisions impact and by which we are influenced, if one of Judaism’s raison d’etre is to create a fair and just society for all then both the Jewish world and the world at large need to be part of the dialogue if we are to succeed. The practices of Reform Judaism are a result of the dialogue between Jewish wisdom and the wisdom of the world, a dialogue between the Jewish community and wider society of which we are an integral part, and holiness which has a uniquely Jewish flavour as well as a spirituality and morality which makes humanity. What is vital is that we understand that the past has a vote not a veto. Yet that is true of all Jewish debate, just as the Judaism of today’s Stamford Hill Charedim does not look like the Judaism of second century Jerusalem nor are the practices of today’s United Hebrew Congregations unchanged from sixteenth century Lithuania. This continual change, responding to the present day, has always been acknowledged. The Talmudic rabbis admit that Moses would not recognise their innovations and I am sure in the same way the Talmudic rabbis would not wholly recognise the way Judaism has developed since Rambam/Caro, particularly since the emancipation. The need for revisiting decisions of Jewish practice are manifold, whether because the social context in which we operate is different e.g. over matters of gender and sexuality or because knowledge has developed e.g. assisted dying or fertility treatment, or practice and ethics have changed e.g. around killing animals for food. So what voices from the past get a vote and how does the present legitimately have a voice while still feeling it is within a Jewish context? In every decision, whether it be our understanding of kashrut or the permissibility of a new medical procedure, what is taken into account should always be the same, yet how you weigh up each factor is the key to personal autonomy. Responsible personal autonomy is one of the defining features of Reform Judaism. In truth, most Jews practice it to some extent, but we consider it our obligation if we are to live our religious lives with integrity. The ‘responsible’ part is the challenge. Being responsible decision makers is not an easy path, but a rigorous and demanding one. It is one that takes continual work (we are not Reformed Judaism but Reform – a continual work in progress.) As individuals, we must constantly challenge ourselves: What decisions have we allowed ourselves to make lazily? What deeper engagement might we be missing out on if we would only allow ourselves the time and personal investment of learning? [ii] The L’Chaim Programme was initiated to empower Reform Jews to engage in deeper thinking about their Judaism. It used a framework of Holiness, Community and Wisdom developed by Rabbis Josh Levy and Laura Janner-Klausner.